Knorr Porcini Mushroom Broth Cube is a concentrated broth cube flavored with porcini mushrooms. 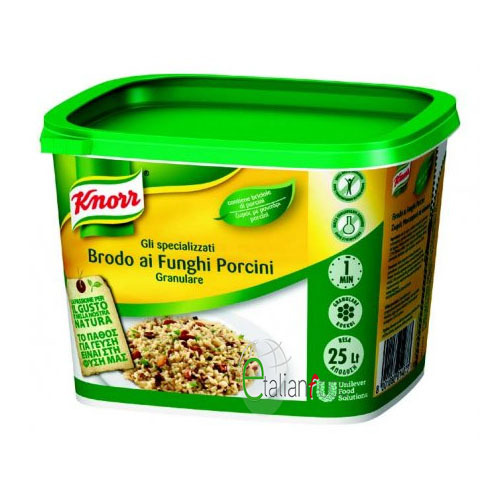 It can be used to give our dishes aroma of mushrooms, can be made a broth for risotto with porcini mushrooms. 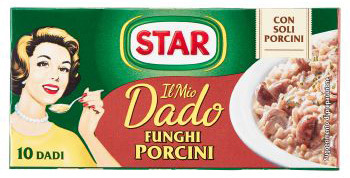 Ingredients: Salt, vegetable fats (palm, shea butter, salt butter), flavor enhancers: monosodium glutamate, disodium guanilate, disodium inosinate; sugar, flavorings, yeast extract, caramelized sugar, maltodextrin, dried porcini mushrooms (Boletus edulis) 0,4%, dried pinarelli mushrooms (Boletus luteus), lemon juice powder, CELERY seed powder. No preservatives, unhydrogenated fats, low-fat.